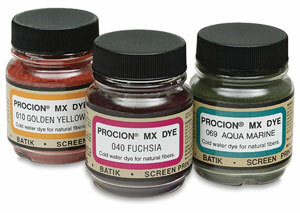 What is in Procion MX dye powder? You are here: Home > All About Hand Dyeing > FAQs > Procion Dye FAQs > What is in Reacive Dye MX dye powder? FAQ: What is in dye powder? The book Reactive Dyes in Biology, edited by Victor Ivanov, includes a description of the ingredients in Procion MX dye powder. The powder contains the dye itself; a buffer (a mixture of potassium dihydrogen phosphate and disodium hydrogen phosphate, which helps keep the pH neutral); an unspecified "diluant" to help in maintaining a consistant strength from one batch to another; and small amounts of "surface active" agents to reduce the dustiness of the powder. The buffer helps to prolong the life of the dye powder, but even with the buffer, hydrolysis - the same process that occurs after the dye is mixed with water - does occur at a slow rate. After hydrolysis, the dye may still work as an acid dye on wool and similar fibers, if used with an acid to reduce the pH, but it will no longer be able to bind to cellulose as a reactive dye. It is normal practice for dye manufacturers to dilute dyes so that they will be a standardized, predictable strength. Sodium sulfate, also known as Glauber's salt, is a popular diluant for dyes. Sodium sulfate may cause Procion MX type turquoise MX-G to dye more intensely, so it can create problems in color reproducibility if you buy dyes that do not contain the same diluant. Some dyehouses pride themselves on never adding extra salt, citing it as a problem for direct application of dye, such as tie-dyeing. Without salt, they say, you have much less rinsing to do before using Synthrapol or other detergent to remove the excess dye from your project. Colorado Wholesale Dyes makes quite a point of this. Excess salt also reduces the solubility of dye, which can make it difficult to dissolve dye at a high concentration. Another commonly used diluant is one of several dispersing agent polymers sold under the brand name of Tamol (see the book Textile finishing chemicals: an industrial guide, by Ernest W. Flick). I don't know which of the many Tamols is used in Procion dyes. Tamol is light and "fluffy", while sodium sulfate is heavier, so, for a given dye weight, sulfate has an advantage in not requiring as large of a container. Tamol has the advantage of helping to dissolve the dye. Sucrose, or ordinary table sugar, is also said to make a good diluant; however, it will react with fiber reactive dyes just as cellulose does, reducing dye yield. Some brands of fiber reactive dyes also contain a high-pH chemical, such as sodium carbonate, in the dye mixture. Dylon Hand Dye and Dylon Machine Dye contain sodium carbonate, while Dylon Permanent Dye contains trisodium phosphate. Sodium carbonate or TSP produce the high pH needed to activate the cellulose fiber so that it will react with the reactive dye. However, the dye will not only react with dye, in the presence of a high pH; it will just as happily react with water. This means that dye powders that contain sodium carbonate will begin to react as soon as water is added and will "go bad", i.e., lose the ability to react with your fiber, within an hour of being mixed with water. All-purpose dye, such as Rit brand dye, contain large amounts of salt. In fact, all-purpose dye powder contains far more salt than it does dye! All-purpose dye also contains anionic and nonionic surfactants, which are also commonly found as the active ingredients in laundry detergent; they act as wetting agents and serve to help disperse the dye throughout the dyebath.